TEN will premiere its new reality show Recipe to Riches in two week’s time at 8:30pm Tuesday August 27. But in doing so it will bump Under the Dome to 9:30pm which is an unfortunate move. Under the Dome has been TEN’s best rating show lately so let’s hope this doesn’t do to Recipe to Riches what The Renovators premiere did to MasterChef. That was recently labelled one of the worst programming moves of the last decade. 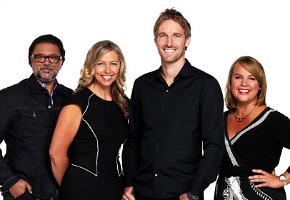 Recipe To Riches will move to a 7:30 timeslot on September 3rd. Recipe To Riches is an innovative, competitive series that takes much-loved home recipes from everyday Australians and turns them into top-selling products on the shelves of Woolworths supermarkets. Each episode, three budding food entrepreneurs will be guided, mentored and judged by our experts: Carman’s Fine Foods owner Carolyn Creswell, advertising guru David ‘Nobby’ Nobay and renowned chef Darren Robertson. Joining them to choose the winner will be GM of Customer Loyalty for Woolworths Supermarkets, Lizzy Ryley. Watch the show and buy the products the very next day. Under The Dome’s scheduling is determined by CBS in the US. Ten couldn’t afford to delay starting Masterchef, its was all they had for Winter, (before UTD turned out to be a hit). It just means they have to either start R2R the week after Masterchef or move UTD one week to use MC as a lead-in. They chose the later to minimise the chances of another new show failing to launch. In the old days it wouldn’t even be a problem. but these days viewers have lots of choices and seem to be looking for excuses to stop watching shows.